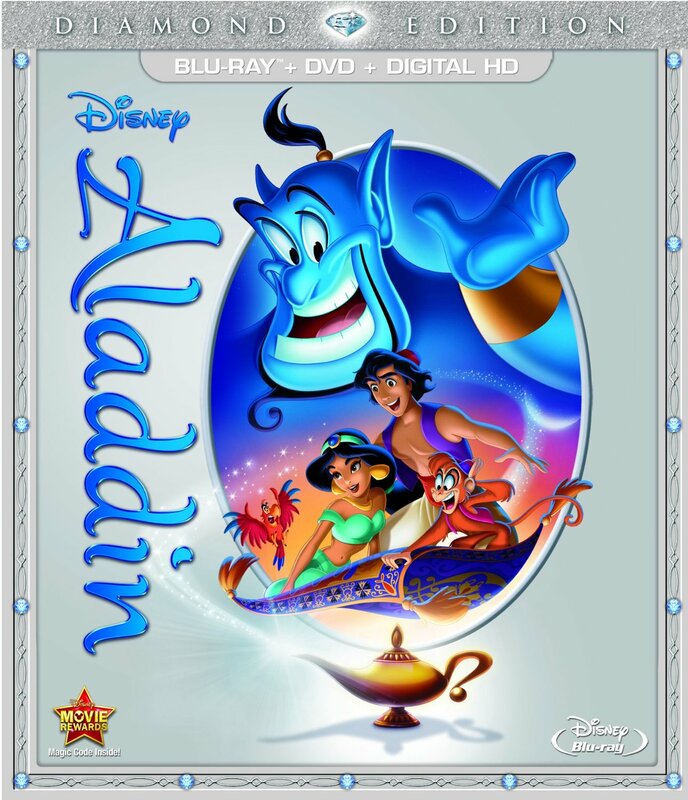 Disney's Aladdin has been given the blu-ray Diamond Edition treatment and it is beautiful in all it's high-definition glory. The artwork of Aladdin has always been great but in high-def it's just really gorgeous. There are some CG elements, not many but they're noticeable. The blending between the CG and hand drawn animation was well done but not quite seamless. The animation is wonderfully fluid and kind of reminds me of that old PC game, Prince of Persia. Regardless of the story, this is a fantastic looking film. The story involves a young man named Aladdin who lives on the streets and steals for survival. He meets a princess who went to the market in disguise as a commoner when she accidentally steals something and he helps her out of the jam. But things go wrong when they get caught and Aladdin is thrown in the dungeon. A creepy old man who is not who he seems helps Aladdin to escape in exchange for his help in retrieving a magic lamp. This lamp holds, as we all know, a magic genie played by the wonderful Robin Williams. His energy and comedy raises this film from pretty good to really enjoyable. So now there's the plot where Aladdin uses magic to help him get the princess to love him, and another plot where the king's most trusted adviser is trying to get the genie's power to become all powerful. The Diamond in the Rough documentary is pretty good and is the length of a movie, and the Genie Outtakes and Genie 101 are both nice tributes to Robin Williams where we get to see some of his riffing and hear people talk about him. We also get not one but two full-length audio commentaries, one from the filmmakers and one from the animators. This is a really great release and wouldn't hesitate to recommend it.